Last night I walked in the door, and Clare had this beautiful charcuterie plate waiting for us to sample. Charcuterie has become our new favourite treat on weekends . Charcuterie is a French word that means cooked meat or flesh. It was used to designate butcher shops in fifteenth-century France that sold cooked pork. They weren’t allowed to sell fresh pork so they devised different ways of cooking the meat, salting, smoking and curing it, and using salt and a variety of spices. I’m not sure who the first person was to introduce cheese to charcuterie, but remind me I have to thank them. Our board was teeming with Wilton cheese, goat cheese and red pepper jelly. And of course, you can’t enjoy charcuterie without wine. Last night, Dave and I enjoyed a bottle of The Tragically Hip’s Fully Completely 2015 Grand Reserve to keep it local. This week’s #HappyAct is to prepare a charcuterie board and enjoy. It’s the perfect dish for entertaining during the holiday season. What’s your favourite charcuterie item? Leave a comment. What a wonderful and thought provoking story. Michael Carlevale introduced me to the epicurean delights of Italian example of these appetisers. All those lovely salami, proccotto, marinated vegetables and salted fish with added fun of the grissini stick. In New Zealand there is much seafood that is displayed thd same way. Here in Australia my favourite is the newly developed Beetroot Dip. It is combined with feta, ground nuts and sometimes houmus. Preparing it this way has allowed Beetroot ( which had a bit of a bad rap because of its odd name and ordinary taste) to flourish into a gourmet delight that has vivid colour and is very very good for you. I always love hearing the different regional variations of food, that’s so cool David, thanks for sharing! We regularly have a charcuterie platter for lunch on the weekends and often serve it in place of hors d’oevres when friends come over. Not sure I have a favourite item, but always have pickles and a variety of olives to complement the cheeses and meats. I’d have to say my favourite would be salami from the menonites in Kitchener. Yummmm! Ooooh, I love mennonite sausage too, Karen, worth the trip to St. Jacobs definitely! 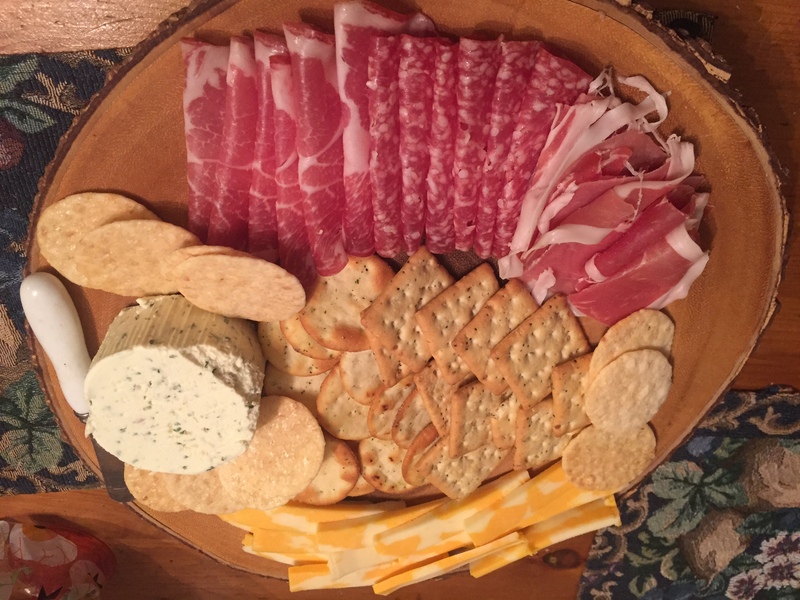 We had a mini charcuterie board last night when we had the Yokoyamas over for dinner. We had salami and Old Croc smoked cheddar cheese from Denningers, antipasto and crackers, and of course a side of potato chips! I’ll have to remember to add potato chips next time–a brilliant inspirational addition to any board!